Rinse and prepare the quinoa according to package. Let quinoa cool to room temperature. 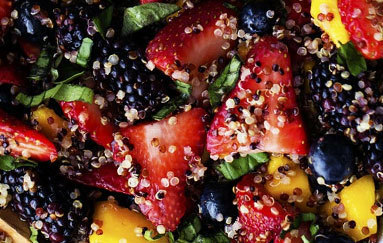 In a large bowl, combine quinoa, strawberries, blueberries, and mango. To make the glaze: In a small bowl combine the honey and lime juice. Drizzle over the fruit salad and toss to coat. Garnish with fresh basil.